How tall is Dave Bautista? David Michael Bautista, Jr. was born on January 18, 1969 in Washington, D.C., to Donna Raye (Mullins) and David Michael Bautista, a hairdresser. His father is Filipino, and his mother has Greek ancestry. When WCW officials told him he'd never make it in sports entertainment, Bautista pushed himself to achieve his dream of being a Superstar. In May 2002, he made his debut on SmackDown using the ring name Batista, but it wasn't until a move to Raw and two victories over Kane that "The Animal" began to make noise in the WWE Universe. The wins impressed Ric Flair and Triple H, who were looking to align themselves with the industry's brightest new stars. After a lengthy search, they identified Randy Orton and Batista. Collectively the four Superstars became known as Evolution. Batista earned his first championship alongside "The Nature Boy" when the duo captured the WWE Tag Team Championships in December 2003. As Evolution dominated WWE, Batista started to emerge from the shadows of Triple H and Ric Flair. By the time Batista won the 2005 Royal Rumble Match, World Heavyweight Champion Triple H viewed him as a serious threat to his title. After a triceps injury at the hands of Mark Henry forced Batista to relinquish the title in January 2006, he vowed to return. Batista successfully regained the World Heavyweight Championship at Survivor Series in 2006. Four months into his second reign, Batista faced the Undertaker at WrestleMania 23. "The Animal" took Undertaker to the limit, but was unable to stop the streak of "The Deadman" at WrestleMania. Though disappointed, Batista stayed hungry and always managed to keep himself in the championship hunt for the rest of his career. At Bragging Rights in 2009, Batista shocked the world when he blamed Rey Mysterio for a loss to Undertaker, then attacked his former tag team partner. "The Animal" then became locked in a tense rivalry with another former friend, John Cena, over the WWE Championship. The grueling match at Over the Limit led to a wheelchair-bound Batista declaring "I quit!" the following night on Raw before fading from the WWE Universe in May 2010. 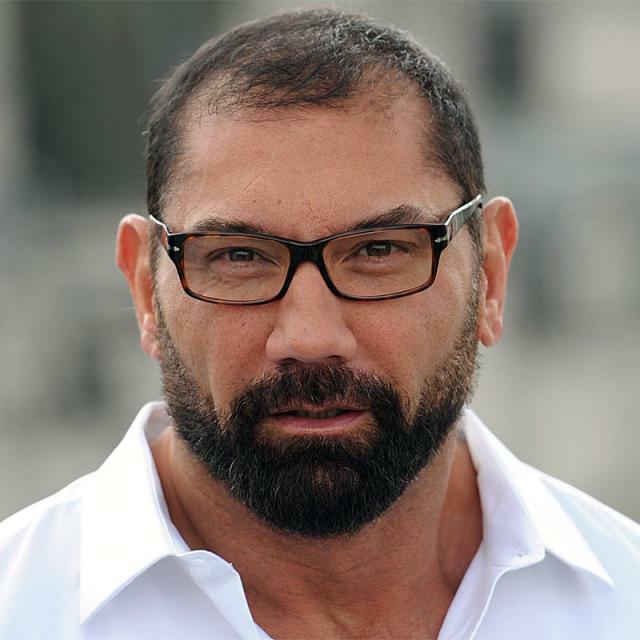 Following his departure from WWE, Bautista appeared opposite Vin Diesel in the Universal film Riddick (2013) and RZA's feature directorial debut The Man with the Iron Fists (2012), in which he played the villainous Brass Body and starred opposite Russell Crowe and Lucy Liu. His other film credits include The Scorpion King 3: Battle for Redemption (2012), where he played Argomael; the action film House of the Rising Sun (2011); and Wrong Side of Town (2010) opposite rapper Ja Rule. Two years later, he joined MMA and won his first professional MMA fight. In January 2014, he made his long awaited return to the WWE, before quitting a second time in June of that same year. He did this in order to promote Guardians of the Galaxy (2014), which was released on August 1, 2014, and starred Chris Pratt, Benicio Del Toro, Zoe Saldana, and Djimon Hounsou, alongside Bautista. He will shoot Kickboxer: Vengeance (2016), directed by John Stockwell, and co-starring martial artist Alain Moussi and UFC fighter Georges St-Pierre. The remake of the 1989 Jean-Claude Van Damme film, Kickboxer (1989) is about two brothers David and Kurt Sloan; When David wins the Karate World Championship, a promoter lures him to Hong Kong, despite his brother's protestations that the man is a crook. When Kurt travels to Thailand to meet his brother, he discovers he has died and seeks his revenge.